This is only the second cookie I have ever made that is dipped in chocolate. It just happens that I am making them back-to-back. Besides both being dipped in chocolate, they were also both inspired by my trip to Europe. Eventually this inspiration will stop, but I still have a couple more things up my sleeve all stemming from the trip. What can I say? It was a pretty awesome trip. I was visiting Louisville over Memorial Day weekend, and Erin’s mom gave me a recipe for some “Orange-Chocolate Cookies.” Their family loves them, and they thought the cookies would be perfect for the blog. While I was sure that some people would find them tasty, they didn’t sound up my alley. 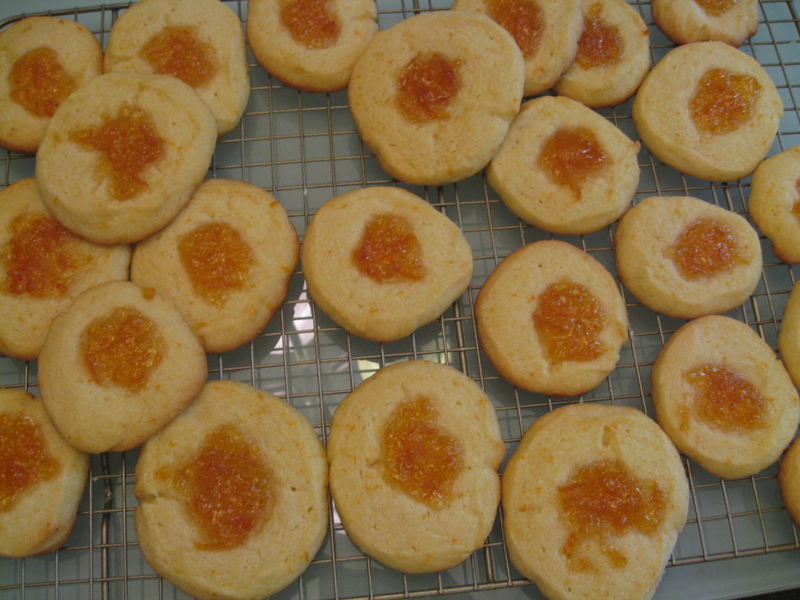 Orange marmalade in a cookie? I put the recipe aside to make for Erin’s birthday in October. While I was in London, my friend Dave asked me to pick up some “Jaffa Cakes” and sent me the following description: “Jaffa is in the shape of a circle, about 3in. in diameter, flat, and made of golden cake w/ chocolate icing and an orange filing. A delicious after-dinner treat.” I couldn’t find the cakes in London but did manage to find a knock-off brand in Germany. After returning home from my trip and delivering Dave his cakes, I was cleaning off my desk and ran across the orange cookie recipe. Sure enough, it was exactly like the Jaffa cakes but with a cookie base instead of a cake base. Since TWO of my good friends loved this flavor combination, I thought I had better test it out. As they promised, it was amazing. I had one cookie, waited a few minutes, and picked up another. I had to pack up the cookies on plates to give away in order to avoid eating the entire batch. That night, I walked in my door after dinner and immediately regretted my decision not to save just one more for myself. They really would be a “delicious after-dinner treat” (or really and “any-time-of-the-day treat”). Oh, and one last tid-bit that makes this story even better: Erin and Dave are dating. Must be because of their shared love of orange marmalade. 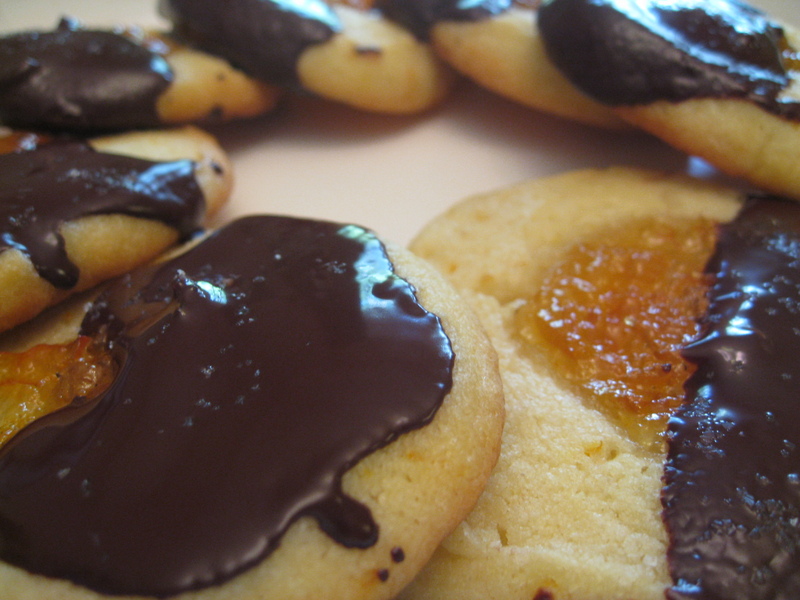 CITATION: I adapted these cookies from an April 2005 “Traditional Home” recipe for “Kosta House Orange-Chocolate Cookies.” It is apparently a Swedish cookie. 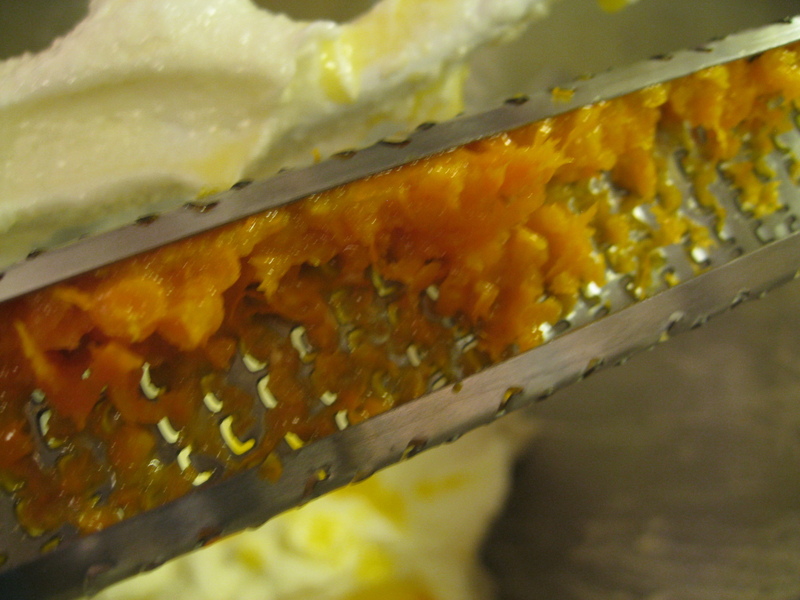 I added some sea salt to the cookie dough as well as a little more orange juice to give it an additional orange flavor. I substituted dark chocolate for bittersweet chocolate and finished it off with just a sprinkle of salt at the end. Beat in egg yolk, orange peel, and orange juice. Slowly add the flour and salt, stirring instead of beating for the last edition. Roll the dough in to a log. At this point, I put the dough in the refrigerator, and I think it made them easier to work with. When ready, cut the dough into slices, place on a parchment lined cookie sheet and stick your thumb into each cookie, making an indent. 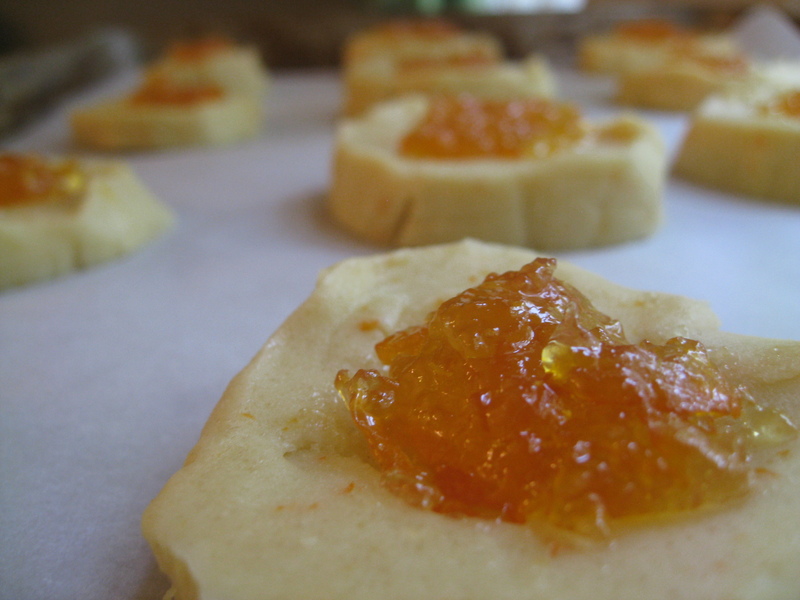 Fill the thumbprint with marmalade. Bake cookies in a 375 degree oven for about 10 minutes. Allow the cookies to cool. In a microwavable bowl, put the dark chocolate and a spoonful of shortening. Microwave in 30 second intervals until melted, stirring after each round. Dip each cookie into the chocolate, covering about ½ of the cookie. Sprinkle with sea salt (optional). Eat dinner and then enjoy a cookie or two.